A smart home system is a smart investment. It can make your home energy efficient, safer, and a more fun place to be. But you need to make sure you make the right choice when you jump on-board. Don’t miss Bosch Smart Home. Bosch is a brand you can rely on. As well as being over 100 years old, established in 1886, it ranked no. 2 in YouGov’s 2018 index of UK home appliance brands. Bosch has now taken its famed expertise as a world leader in heating, power tools and almost every imaginable kind of home appliance, and applied it to the exciting new world of the smart home. Bosch Smart Home offers a full array products, focused on making your home safer and more convenient, and saving energy. Made a start on your own smart home setup? Bosch’s family can already communicate with Amazon Alexa and Philips Hue. This is not an insular smart home system. But what products are in this family? The Bosch Smart Home Controller is heart of the system. It communicates with all your other Bosch Smart Home products, and lets you control them with the easy-to-use Bosch Smart Home mobile app for phones and tablets. Even if you’re stuck on the motorway 300 miles from your home Wi-Fi. For example, the Bosch Smart Home Radiator Thermostat lets you control your heating away from home. Or from the sofa. And unlike some smart heating systems, you can set the temperature per room, helping you save even more energy and money. Add several in different rooms and you can create a full zoned system, with a different schedule for each room. The Smart Home Smart Plug offers similar advanced control, but for any plug-in appliance you like, from TVs and game consoles to the lava lamp in the kids’ room. You just plug its adapter into the Smart Plug: no more worrying about whether you left something on after leaving home. You can just check on your phone or tablet, and switch things off from the Bosch app. Bosch also knows it’s sometimes good to get away from constantly looking at screens, so it made the Smart Home Universal Switch. This lets you create endless custom “scenarios” switched between with a quick button press. Each applies different settings for your Bosch Smart Home devices. Perhaps you’ll want one scenario for normal evenings, one for movie night, one for weekends and another for when you leave the house for work. One of the more refreshing parts of the Bosch Smart Home system is that it doesn’t try to take over or change your home. All of the products are simple and unobtrusive, not the smart home equivalent of a prop from a sci-fi movie, even if what happens behind the scenes is just as clever. If you want to save energy, and make your home more convenient to control, you might want to buy Bosch’s Smart Home Climate Control Starter Kit. This includes two radiator thermostats, the Smart Home Controller and Door/Window Contact. These use a sensor that lets you know if you’ve left a window open or if someone tries to break in. You save on energy, and get peace of mind too. That brings us to the other side of the beach Smart Home: security and safety. The Smart Home Motion Detector sends you a notification when it detects motion while armed. It’s clever enough to be able to tell between an intruder and your cat too, and uses both infrared, so it can work in all lighting, and a temperature sensor. If your house is broken into, it can set off the companion Smart Home Smoke Detector. This is another great buy, and lets you call the emergency services direct from the app as soon as you receive a smoke alert. The other two core Bosch home security products, its cameras, can be used either on their own or with the wider system. You don’t necessarily need a Smart Home Controller. 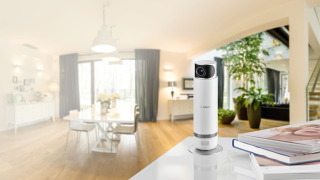 Bosch’s Indoor Camera is one of the most interesting smart home security cameras around. Its camera is motorised, letting it pan to cover a full 360 degrees. You get an even better view than an ultra-wide angle camera. The privacy mode also makes the camera lens retract into the base. You can assure any guests they aren’t being watched. For outdoors use you’ll want the Eyes Outdoor camera. It can record clear 1080p HD video at day or night, doubles as a motion-activated security light and even an intercom thanks to its integrated microphone and speaker. Unusually for a smart home camera, there are no monthly payments to worry about here. There are no hidden fees or nasty surprises with the Bosch Smart Home system. And as the system has been tested and certified secure by independent IT security test provider AV-TEST, you can be sure you’re as protected from digital security threats as physical ones. To get your home primed with smart security, check out the Bosch Smart Home Security Starter Pack. This includes the Smart Home Controller, Smoke Detector, Motion Detector and a Smart Home Door/Window Contact. For more information on Bosch’s Smart Home range, head to its website and e-Shop here.